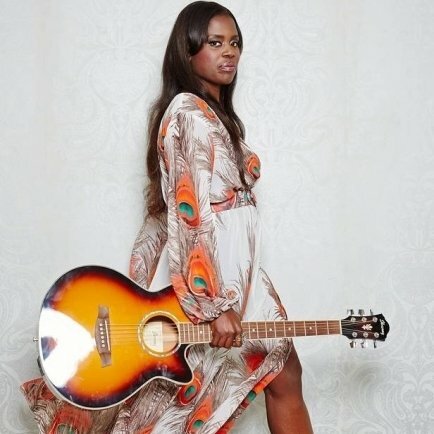 Home » Pregnancy & Parenting » Real Mum Interview : Singer-Songwriter, Nya Jade. 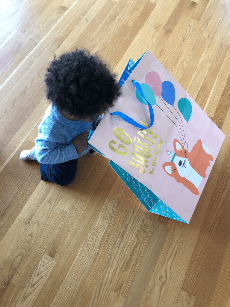 MumsVillage had the opportunity to interview Nya Jade. Mother of 2, author, singer and song- writer. 1. Which 3 things would you like the MumsVillage audience to know about you? I was born in Ghana, but grew up a global nomad. As a result, I love to travel. I’m an author and a singer-songwriter. Author. My genre of choice is Young Adult Fantasy because I love magic and creating magical worlds. I currently have two books in my Phoebe Pope series, which follows the adventures of a teen shape-shifting spy-in-training. Do you have a child? How old are they? Yes! I have two children. My daughter is four-years-old and my son recently turned one. They are a dynamic duo. Close to 5,000 diapers between my two children. That’s a lot of diapers and I’m not close to being done yet. It depends on what’s going on! I’d say three to five selfies a week, but most are with my kids. Does that count? Or do you call those Usies? Lol. How many videos of your kids do you take in a week? Five. That number increases if we venture out on field trips or have friends / family in town. I don’t think becoming a mum created any big personality changes. If anything, it’s amplified just how deeply I can love. And that capacity expanded with the birth of my second child. It’s amazing to experience something so infinite. But I will say that motherhood has tested my need for order. I never knew how much I appreciated minimalism until kids. I’ve had to make peace with the invasion of toys in my house and reframe their presence as a sign of a happy home. So, becoming a mum has increased my flexibility. Which fun activities do you engage in, with your child? My daughter loves imaginative play. Most of her games are very physical – lots of running, jumping and dancing. I credit her with keeping me in shape! She’s very clear about where people need to stand or sit in her narratives that I feel she has a bright future as a movie director should she want it. What is the most memorable thing about being a Ghanaian mum in America? I love sharing Ghanaian culture with my children. If we were living in Ghana, that culture would be an everyday experience for them so it could be taken for granted. In America, something like wearing Ghanaian print clothing stands out. 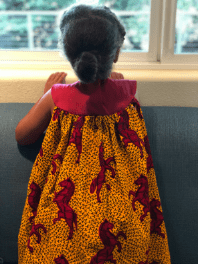 And now that my daughter is at an age where she’s obsessed with dresses, she loves that some of her clothing is made for her in Ghana. She feels extra special knowing that no one else has the same outfit. This year my daughter and I got to talk about Ghana’s Independence Day. She loved having her own small flag to march around the house with in celebration. What do you think is the most inaccurate thing about how movies portray childbirth? Movies tend to only portray the drama of labour and vaginal birth. Maybe I don’t watch enough movies, but I can’t remember any pregnancy storylines that deal with c-section births and recovery. The other day, my daughter picked up her ukulele, strummed it a few times and declared: “My stage name is Ruby Jade!” She was so dramatic about it I couldn’t help laughing. But it was also very sweet of her to incorporate part of my professional name in hers. What are the top 3 child friendly places in your area? The Exploratorium – a great science and art museum for people of all ages. Slide Ranch Farm – a wonderful place on the other side of the Golden Gate Bridge where children connect with animals and nature. Both of my children enjoy the outdoors. 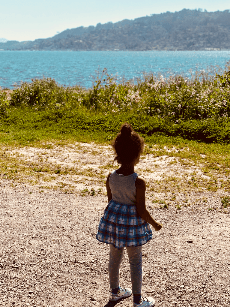 We are blessed to live close to many parks, beaches and hiking trails, which allow us to spend the weekends “searching for an adventure.” And because we live just outside of San Francisco, driving to the city, or taking the ferry in, makes for another fun family excursion. San Francisco offers many great indoor and outdoor activities for active families to take advantage of. I personally love to watch the buffalo in Golden Gate Park. It still fascinates me that there are buffalo in the middle of a city. It’s a bit of the Wild West. I want both of my kids to really experience equality in the workplace and not just the illusion of it written in employee manuals. Do you think your job will exist when your kids are your age (why or why not)? I really hope humans will still be writing novels when my kids are my age. I’ve heard that people have written code for software to generate stories. That’s such a crazy idea to me. I can’t imagine computers creating the kind of three-dimensional characters that draw readers into a story. Authors spend a lot of time conjuring vivid worlds filled with nuances for their characters to inhabit. There is a spirit to writing that I don’t think a computer or robot can re-create. This answer is far from profound. In fact, it’s frivolous. I want my kids to experience Disney theme parks while they’re young. I went as an adult and I couldn’t help thinking how much I would have loved it as a child. I love the innocence of kids believing in magic. I’d love for them to experience a world with no social media. I can’t imagine having social media back when I was growing up. We were busy living life outside and living out loud. I do appreciate how social media allows us to connect, but sometimes it can appear that young adults are obsessed with curating an online life versus just living one. What is one thing you miss about your life before your kids? These days I can hardly imagine life without them so it’s hard for me to feel like I’m missing out on something. However, I will say that social life is a bit less spontaneous. Gone are the days a girlfriend could phone you up and suggest a spur-of-the-moment night out. Those were fun. But with some effort, those dinners happen—even if we have to plan them out weeks in advance. “So, when are you having more children?” Thank you for not asking that! I feel like it’s a very African question to ask, no? I remember a family member asking me that question right after my second was born! Lol. In what ways is your parenting style similar to your mother’s? In what ways is it different? I think the fierce love we have for our children is the same. And devotion. I think I’m a bit more relaxed in my approach mainly because I work from home. This allows me to have more of a “go with the flow” mentality. My mom had a busy work schedule so she had to be super organized. Her home life had to be in order. If my daughter forgets something at home, it’s less disruptive for me to run it over to school. Not so much during my mother’s time with young kids. Also, she was dealing with three kids! My two kids need some organization, but not as much!